Ah, video games and casual drug use. They go together like World of Warcraft and loneliness, don't they? That's why we saw a water pipe made out of an N64 controller last year, and that's why Giz reader James dedicated this past weekend into converting an old NES controller into a bong. 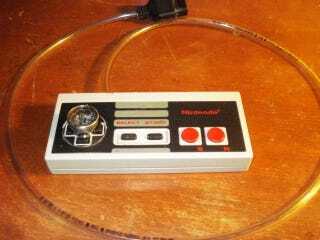 It doesn't work, unfortunately, but I'm sure you'd be bad enough at playing after using this thing without having to try to smoke while also controlling Mega Man. Nice work, James. We like to see young people using their time constructively. Hit the jump for another picture of this masterpiece of ingenuity.